Abstract: Nowadays, we have solid state, nearly indestructible USB flash memory devices that fit neatly on your key chain between the home and car keys. There is nothing quite as satisfying as knowing that the CD-RW has finally been replaced as the most convenient way to store and transfer ~500MB worth of data and files. Okay, a CD-RW holds a little more than that, 650MB to be specific, but that isn't the point. Nowadays, we have solid state, nearly indestructible USB flash memory devices that fit neatly on your key chain between the home and car keys. Rather remarkable if you think about it, and to get back at your data requires only a PC with USB port. Since USB ports are included on all modern computers, that makes the USB flashdrive about as universal as the floppy disk it long ago replaced. With the proliferation of WindowsXP, plugging a device like the 512MB Crucial Gizmo 2.0 into a system doesn't even require drivers - everything is automatic, and after a few seconds up pops a new hard drive. So long as your PC is running Windows2000 or higher, drivers aren't required to configure USB devices. 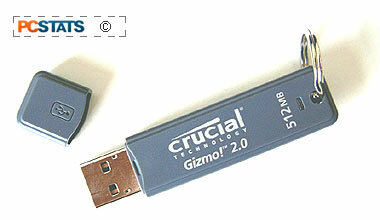 If your computer is running Win98/98SE, there are drivers at Crucial.com (they are not included in the package) you can download to get the Gizmo 2.0 up and operational. Key ring, lanyard and instructions. The Crucial Gizmo 2.0 flash disk we will be looking at in this quick review is 512MB in size, and communicates at USB2.0 speeds. There are also 64MB, 128MB and 256MB versions available, but at $89USD the 512MB version (equivalent to 350 floppy disks) is a pretty good deal. It measures a scant 16 x 67.5 x 8mm, and has a tiny little green LED to indicate activity. The Gizmo 2.0 flash drive is small enough that two can be installed into adjacent USB ports without encountering any space issues. 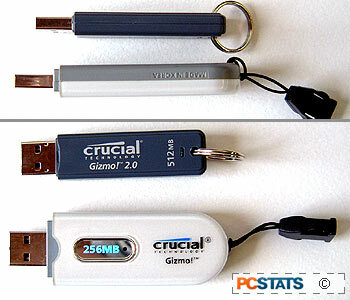 A big problem with a lot of first generation USB flash drives was their size - many were too large to plug directly into a USB slot if there was a USB mouse, or USB cable connected to the adjacent port. Since manufacturers almost always install USB ports in pairs, this effectively limited where you could plug a small USB flash drive in. On laptops, this problem could be extremely aggravating. This is why many USB flash drives were, and continue to be shipped with USB extension cables. Now, who really wants to carry around an extension cable so they can use the USB flash drive dangling off their key ring? No one I'd wager, which is why we're quite pleased with the size reduction the Gizmo 2.0 takes over the first Gizmo model released by Crucial (shown above in white).